For 8 days and 7 nights you will be inspired by the wonders and adventures of ART and TRAVEL. For a trip that will hold special memories for a lifetime…..
Each Day will be filled with views of the beautiful French countryside while we journey to medieval villages to shop at amazing markets. Visits to centuries old UNESCO sites or travel through the Camargue Region were the Ancient breed of white horses and flamingos run free. Find inspiration while visiting local artists studios, galleries and art museums, or walk in the steps of the art masters. Hangout in a French cafe’ enjoying Cafe Au Liat and delicious handmade French Pastries while chatting about our latest inspirational finds. Guests will enjoy handcrafted, healthy gourmet dinners at the RHONE RETREAT and at some of the finest restaurants in the region. Visit outstanding vineyards to taste the organic wines of the region. Experience a French holiday B&B (bed & breakfast) accommodations at RHONE RETREAT. A beautiful property built in the early 1800’s, located in a quaint South France village of Gaujac, surrounded by numerous vineyards, historical sites and activities. Breakfast at Rhone Retreat, then off to Avignon known as “the city of the Popes.” We’ll walk through the cobble streets and marvel at one of the world’s most spectacular fortified cities and a UNESCO World Heritage Site. With time, we will visit Musée Angladon to see one of the best French impressionist art collections in the region. A pique-nique in the gardens of the Pope’s Palace in Avignon. Of course, after tasting one of the best wines from our region …Chateau neuf du Pape!! With our palates full, We Return to Rhone Retreat. Evening is a fabulous dinner with delights from our garden and region, as we start to understand why the Provencal diet is so healthy; it’s fresh!!! Evening Dinner at Rhone Retreat. It’s going to be an art-filled day! In the heart of the Alpilles, St. Remy-de-Provence, where Van Gogh painted some of his most famous works, the antique Market is a must stop. Be inspired by the projections of a master’s work at Carriere de Lumiere. Dinner features more delights from the region. Take a Massage today and just relax or join us on a morning walk as we visit L’Oppidum, the remnants of a Roman officer’s bath house. Not far from the gates of Rhone Retreat . A VISIT TO A LOCAL ARTIST STUDIO, after Lunch we will visit a local artist’s studio a village away. We will find ebiniste and artist, Loic Meze who is a true re-see-er that brings old and discarded into new life again. It’s a thrilling day to take a Luncheon Cruise to historic Arles, another influence of Van Gogh’s most prolific time, visit his museum and so many fun local shopping opps. Another night out on the town, we are off to be wowed and nourished by owner and part time chef Valerie at Le Bernon. Another fine example of this new twist to traditional local cooking or what Ken likes to refer as…… French Provencal revisited. 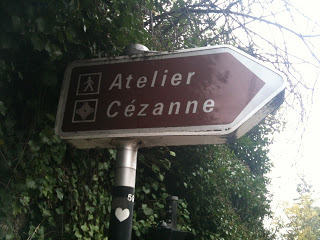 (one of my Favorite Places) There we will follow in Cezanne’s Footsteps to see his art studio where he painted and the plain aire locations and - inspirations we see in this ART masters works. A Breakfast Goodbye and Travel to Marseille to Catch Your Plane!! ……… but not to worry because as we say here at the Rhone Retreat…………………… Once you Gaujac……….. You always’s go back!!!!!! Disclaimer: Itinerary may change due to weather or unforeseen conditions. Comparable activities will be substituted. ⦁ Cost of the 8 day / 7 night tour $4500 USD per person double occupancy (sharing one bedroom). For a single room (one bed in one bedroom with en suite bath), the cost is $5000.00 USD. ⦁ A non-refundable* deposit of $1500.00 USD will secure your reservation. PLEASE REMIT DEPOSIT NO LATER THAN APRIL 30, 2019. * Deposit refundable if tour is cancelled on behalf of hosts, due to unforeseen conditions. Free travel transfers to and from Marseille Airport. 6-nights accommodation in a charming Bed & Breakfast set on picturesque grounds with lush gardens, complete with sparkling pool. 1 night stay and accomodations at the historical HÔTEL DES AUGUSTINS in Aix en Provence. Organized outings ranging from a visit to the Pont du Gard (Roman Aqueducts) to local village streets of France in the outdoor Market,and visits to Artist Studios. Prearranged Wine tasting with one of the many local wineries. One free Couples Massage from Ken Jourdan, Rhone Retreat owner and licensed Massage Therapist with 25 years experience. A variety of free and optional paid add-on excursions. SPACE IS LIMITED TO 6 GUESTS > THIS IS A FIRST COME FIRST SERVE OPPORTUNITY. To secure your reservation > Please fill out the form and reply with your reservation request, mailing address and phone number. You will be sent a confirmation email with directions on how to secure your reservation payment and further information. TIME IS LIMITED > Your invitation expires April 30, 2019. tour will be rescheduled if empty slots remain. During our week together Ken Jourdan, our Rhone Retreat host and chef, will lead us on excursions to the inspiring markets of Uzes, a small town on the edge of the Languedoc Roussillion region. The market sprawls through the cobblestone streets with bounties of color and scents. We will also visit UNESCO’s World Heritage site, Pont du Gard, an amazing example of the role that Romans played in the history of our region. We’ll explore the quaint village of Goudargues, and a morning hike away from the gate’s of the Rhone Retreat, is l’Oppidum, the remnants of a Roman officer’s bath house. These are just a few of the treats that we have in store for you while you visit this region. Ken is also a 20 year veteran masseur and all participants will receive a relaxing 60- minute massage during their stay. Marti Schmidt a seasoned World traveler and Artist for over 30 years will be your guide through one of the most beautiful parts of Southern France. Marti’s knowledge and love of the Provence Region and beyond has developed over the years and now she has curated the “PROVENCE FROM AN ARTISTS’ POINT OF VIEW TOUR”, exclusively as a intimate look her favorite inspirational art locations. Some of these are out of the way famous sites, including artists studios, cities, villages, museums and galleries. In a region rich with history, art , architecture, culture and lifestyle.